Lisa Lynn March 9, 2013 March 9, 2013 3 Comments on Farm to Table Through the Year E-book Announcement! 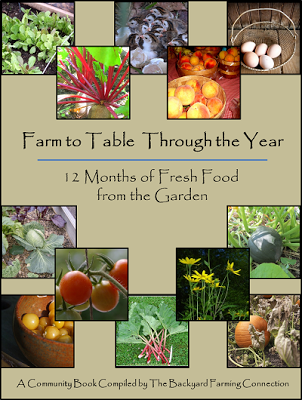 I’m very excited to announce the upcoming release of the new Farm to Table Through the Years e-book on March 14th! This book was compiled by Gretchen Stuppy Carlson from The Backyard Farm Connection and the 12 chapters were authored by Gretchen and eleven other bloggers, including yours truly! It will be available free of charge beginning on Thursday, so stay tuned! Starting Monday, you will have a chance to win a selection of heirloom vegetable seeds from Marys’ Heirloom Seeds! 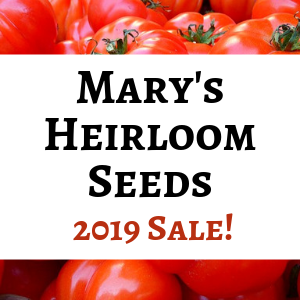 Mary has hand selected a variety of non-GMO, organic heirloom seeds for one lucky reader! My co-host for The HomeAcre Hop, Jenny from Black Fox Homestead, will also have the giveaway listed on her page. Please stop by and visit one of us starting on Monday for your chance to win these wonderful seeds! Have you shared a link to your blog hop or carnival on The Linky Love Party yet? I created this linky party so that hop hosts will have a linky especially for promoting their party! What’s that? you don’t host a party? Well, stop by The Linky Love Party to check out all of the awesome hops that you can join each week! You can also grab the code for the party or for the button to place on your blog for a quick way to visit the party for hops to join each week. How cool is that?! Note: I’ve been experiencing some technical difficulties today and lost some data. The post that i originally published today was lost so I’ve recreated it as best I can. Also note that The Creative HomeAcre Hop will most likely go live a bit late tomorrow. I lost that post too and will have to start from scratch. I apologize for any inconvenience, but I’ll have everything back to normal soon. Thanks for your understanding! » The Victory Garden of Tomorrow Review and Giveaway! Thanks Mary 🙂 I think I’ll have it ready in time! UGH! I hate when that happens! Looking forward to all of the helpful tips and recipes tomorrow. Aww sorry about your site. I was wondering where you went. Glad you got it all worked out.